Rev. Manning goes really hard on the birth certificate issue . Although I am not a birther, per se, there are a number of unanswered questions and peculiar actions by many institutions make me wonder what are they trying to hide? A third instance of Elena Kagan opposing Americans’ Second Amendment right to own a gun has now become public, and is sure to become a major issue in her Supreme Court confirmation hearings. And it confirms that President Obama’s gun-control agenda is to create a Supreme Court that will “reinterpret” the Second Amendment until that amendment means nothing at all. This year, no case on the Supreme Court docket is more important than McDonald v. Chicago, where the Court is deciding whether the Second Amendment right to keep and bear arms is only a right you have against the federal government, or instead if the Second Amendment (like most of the Bill of Rights) also secures a right you can assert against state and local governments. At issue is whether Chicago’s law banning all guns—even in your own home—is constitutional. When the Supreme Court considered its last Second Amendment case, District of Columbia v. Heller in 2008, then-U.S. Solicitor General Paul Clement filed a brief in the case, and then requested and received time to argue the federal government’s position in that case as to the meaning of the Second Amendment. When the McDonald case was argued before the Court on March 2 of this year, current Solicitor General Kagan argued… Nothing. Not only did she not ask for time during oral argument, she didn’t even file a brief (which the solicitor general routinely does in important constitutional cases—and the McDonald case is monumentally important). If someone asserts that the solicitor general shouldn’t file a brief because it’s a state matter as to whether the Second Amendment is “incorporated” to the states through the Fourteenth Amendment (which is the issue in McDonald) the record speaks to the contrary. The last time the Supreme Court “incorporated” a right from the Bill of Rights to the states, in the 1969 case Benton v. Maryland, the solicitor general filed a brief, and then (just like Heller in 2008) got divided argument time to express the government’s views in front of the Court. Why wouldn’t Kagan file a brief expressing the view of over 75% of Americans that the Second Amendment is an individual right, one that every American citizen has against all levels of government? Then it became public that when the Supreme Court was asked in 1987 to decide if the D.C. gun ban was unconstitutional (the same law that the Court eventually struck down in Heller), Kagan wrote to Justice Marshall on the Court that she was “not sympathetic” toward the argument that the Second Amendment doesn’t allow D.C. to completely ban all guns. Three anti-gun decisions. Three strikes, and you’re out. The bottom line is that Barack Obama supports the Chicago gun ban, a position he publicly repeated as recently as June 26, 2008 (the day the Heller decision was released). President Obama believes that there’s nothing unconstitutional about the city—or even the whole state—where you live completely banning you from having any firearms for hunting or self-defense, even in your own home. President Obama—the most anti-gun president is American history—has nominated for our highest court a close personal friend of his. And now we see that Obama has every reason to believe that his close personal friend shares his radical view on the Second Amendment, one that will work against the constitutional rights of 90 million American gun owners. 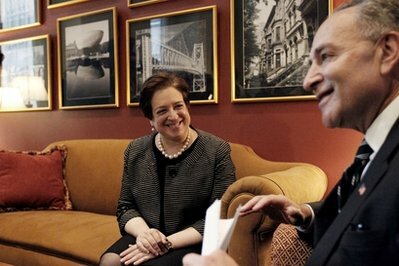 Elena Kagan’s confirmation hearings this summer could get very interesting. America’s gun owners have a way of making their voices heard.